The Conflict between Palestinians and Israelis has been the political issue occupying most time on the Agendas since the creation of the United Nations. The reason why the conflict continues is the Western Reluctance to force Israel to withdraw from the areas it has historically occupied. This reluctance is especially displayed by US vetoes against UN Security Council Resolutions condemning Israeli Agression. Below You'll find Material on the UN involvement in the Conflict. 1948 UN General Assembly resolution 194 granting the Displaced Palestinians during the 1948 War the right to return to their land, after having been expelled by Israel. When Israel was admitted as member to the UN it was forced to recognize this Resolution, but it has ever since rejected fullfilling it. 1967 UN Security Council Resolution 242 adopted in 1967 obliging Israel to withdraw from the Areas occupied in its war of Agression in june 1967. Israel still refuses. 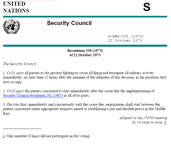 1973 UN Security Council Resolution 338 from 1973 stating that 242 Must be Implemented, and Negotiations started to establish a Durable Peace in the Middle East. 10th UN Emergency Session on Palestine. This Session has been ongoing since 1998.